Let's take a step back and take into consider the global population. As it grows in tangency with life expectancy, the demand for education is exponentially growing with new learners introduced to the world. However, available teaching time and teachers themselves are very limiting and moves linear at best in the chart. Then, what beholds the future for Educators? Personalized learning - Personalized learning allows learners to learn at their own pace. Additionally, the learning objectives, instructional approaches, and educational content may vary based on the learners’ needs. Learning activities are driven by the learners’ interests and could even be self-initiated. Learners are given a choice in what, where, and how they learn. Personalized learning that’s supported by education technology has the potential to decrease the teachers’ workload. However, traditional teachers still rely on static, non-personalized educational content. Many instructional materials such as books are, at best, delivered in a digital format. When publishers need to sort through their content collateral, they’re still dependent on manual editing, manual meta-tagging* and manual content classification which is very likely prone to human error. The shift from traditional content, to digitally formatted content will change yet again to highly automatized and adaptive format. The Education Technology industry will rapidly develop technologies to support this shift. For example, when we implemented 360AI¹ for a large Dutch publisher, Malmberg, we helped them scale their educational content through artificial intelligence. After the implementation, we helped them achieve a 95% accuracy rate of matching their English language learning content to the right learners' level ranging from A1-C2. WHERE DOES THE EDUCATION TECHNOLOGY (EDTECH) INDUSTRY STAND TODAY? The global education technology market snowballed to 150 billion in 2017 and will continue to grow 20% annually. As stated before, the number of learners will grow exponentially, driven by economic progress of developing nations, demographic trends and increased globalization of economies and societies. As a result, the educational movement will drive trends such as lifelong learning. Overall, we’re in the middle of an AI revolution. Smart automation is rapidly affecting almost aspect of life and work. There is a tremendous opportunity to use technology and make the whole education industry both smarter and faster. ¹360AI is an intelligent content management platform for educational publishers and content providers. The 360AI platform offers a suite of products that automate educational content creation and content delivery. 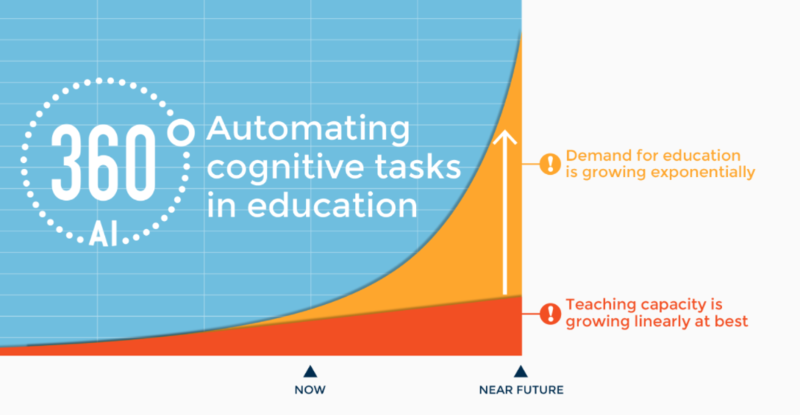 360AI automates cognitive tasks traditionally done by humans. Previous WILL EDUCATIONAL PUBLISHERS SURVIVE AI INNOVATION?